Yesterday was an incredible display of raw power by the Manx Missile, Mark Cavendish. He showed to every critic that he has the power to win. Only 23 years old and his first attempt at Sanremo resulted in a huge 'monumental' victory. The missile to the finish! 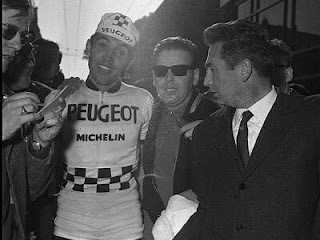 Eddy Merckx's first Sanremo win, also on his first attempt was back in 1966. The Cannibal was only 21 and went on to set a precedent of seven victories. 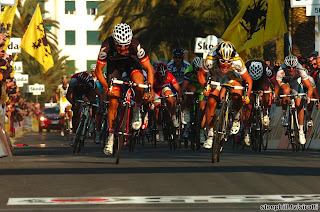 Cavendish is not a Merckx, nobody is, but I have a feeling that he has the potential for more. He has the engine. Heart wrenching for Heinrich Haussler (2nd) and a great third place for Thor Hushovd. Honorable mention goes to the Canadians' Ryder Hesjedal (31st) & Svein Tuft (138th & also in his first attempt). Cavendish said it best when nobody expected him of anything, "I wanted to prove I am more than just a sprinter, but a great rider - that is what I did today." The Cannibal's 1966 rookie win! 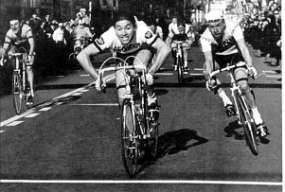 The Cannibal beating Adriano Durante(2nd, obscured) & Herman Van Springel(3rd, far right)! The young Cannibal smilin' monumentally on his way to seven!